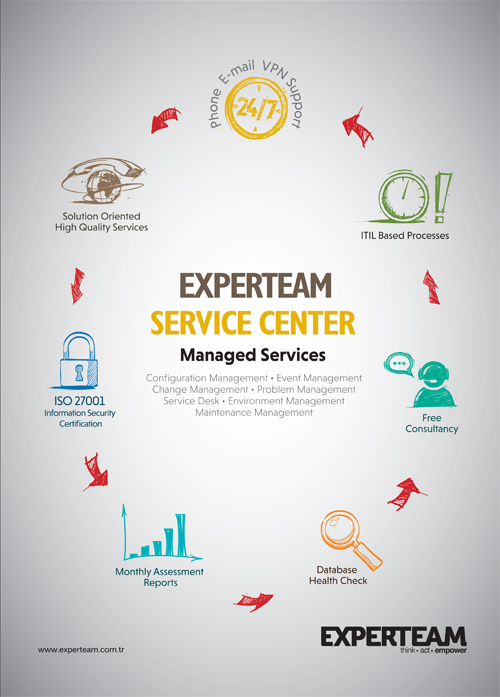 Experteam Service Center offers service for its customers remotely in order to sustain the lifecycle of systems after completion of project. ESC (Experteam Service Center) supports its customers with its expert staff in demand satisfaction, response and solution under the ITIL processes. In this lifecycle, problem notifications, replacement demands, additional adjustments in the existing use and new application demands of the customers are met and delivered on specified date of delivery. Services are offered for the customers remotely in line with the experience. Thus customers can access to the experts in their solution-oriented works without any planning. As a result, they can receive productive and cost-effective solutions. Being aware of the importance of security in remote access, the ESC has restructured its all work flows and activities according to its ISO 27001 Information Security Certificate.